Safe driving is not only essential for the safety of yourself and the vehicles occupants but with ever increasing insurance costs, an accident may increase your car insurance premium drastically. Upon passing the driving test, bad driving habits soon accumulate and become part of normal driving for many of us. These bad habits may seem trivial, but it’s these bad habits that are the result of most road traffic accidents. Explained are essential, but simple safe driving tips designed to enhance your driving skills, confidence and awareness leading to a better, safer driver. Although there are many more drivers on the roads these days, there are fewer fatalities. This is due to safer road conditions, safer vehicles and in part, the higher standards needed in obtaining a driving licence. Many of the bad driving habits unfortunately remain with many and below details the most common causes of road accidents and how they can be prevented. Driving too closely to another vehicle in front (tailgating) is dangerous and is one of the main causes of road accidents as it simply does provide a driver with enough reaction time to stop in the event of the vehicle braking or stopping suddenly. Tailgating is also illegal. In the event of sudden braking or stopping, it not only increases the chance of you hitting the vehicle in front but the vehicle behind you is at risk of hitting you also. Maintaining a safe following distance increases your thinking and stopping distance. If you are unsure of a safe following distance, the 2 second rule is an easy method for such safety aspects.Other than safety factor, driving too close to a vehicle in front causes greater brake and disc wear due to the constant accelerating and slowing, increases fuel consumption. A safe following distance allows the car more often to slow down without the need to brake and as a result less acceleration is needed.If a vehicle is driving too close behind you, increasing the distance from yourself and the vehicle in front of you will allow you to slow down over a greater distance, therefor giving the driver behind more time to react. Along with keeping a safe driving distance, safe braking techniques such as progressive braking makes for safer driving, and reduces wear on braking systems and tyres. As it enables you to keep better control of the car. 40% of all road accidents are due to drivers failing to look properly. A typical example of why these accidents occur is a lack of appropriate observations before changing lanes. 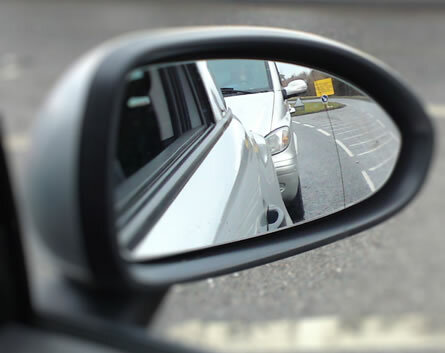 Most of us look into the mirrors before making a lane change but can forget to check the blind spot. A car can easily be obscured by either the left or right blind spot plus smaller vehicles such as motorcycles and in towns and villages cyclists. Before changing lanes in any situation whether on motorways / dual carriageways, multi-lane carriageways in cities and even at busy roundabouts, check the mirrors followed by the applicable blind spot side. See the car blind spot for further information. Speeding related accidents result in around a quarter of all fatalities. Speeding is not only dangerous but significantly increases fuel consumption and the time gained by speeding is often much less than you might think. For instance, driving at 80 mph instead of the legal limit of 70 mph on motorways can increase fuel consumption by up to 25% and over a 60 mile trip will save just 6 minutes. A loss of car control is often due to a driver traveling too fast for the road or weather conditions. A massive one third of all road accidents are due to this. We are all aware of how perilous the roads can be in winter, but many lose control during the warmer months. A road that has been dry for a long period will produce a build-up of oil and grease which when dry is not an issue. As soon as the road surface comes in contact with water, the oil and grease will rise to the surface of the water making the road hazardous until it is washed away. During such conditions, significantly reduce your speed, especially on bends and increase the stopping distance from yourself and the vehicle in front. Another issue associated with wet weather is aquaplaning. Aquaplaning is when a layer of water forms between the road surface and the tyres and depending on certain factors, can lead to a complete loss of car control. If ever experienced, aquaplaning is perhaps one of the most terrifying moments. Read the guide on minimising the effects of aquaplaning and how to regain control.